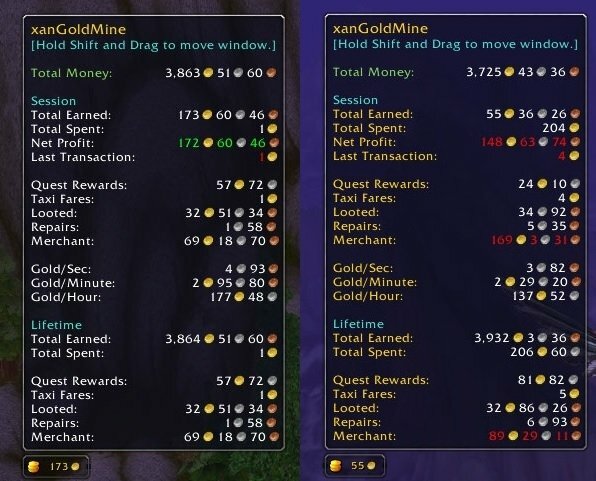 A small button frame addon that tracks gold progression on your characters and provides a detailed breakdown of gold earnings in a tooltip. NOTE: This is NOT a Databroker (LibDataBroker) addon. It provides it's own frames and remembers positioning. This addon has a configuration screen that can be access using WOW Menu -> Interface -> Addons. It also supports localization for other languages. Please donate your language locale files! Net Profit = Difference in +/- based on Earned and Spent. Last Transaction = Last recorded +/- gold transaction. Quest Rewards = Gold earned in quest rewards. 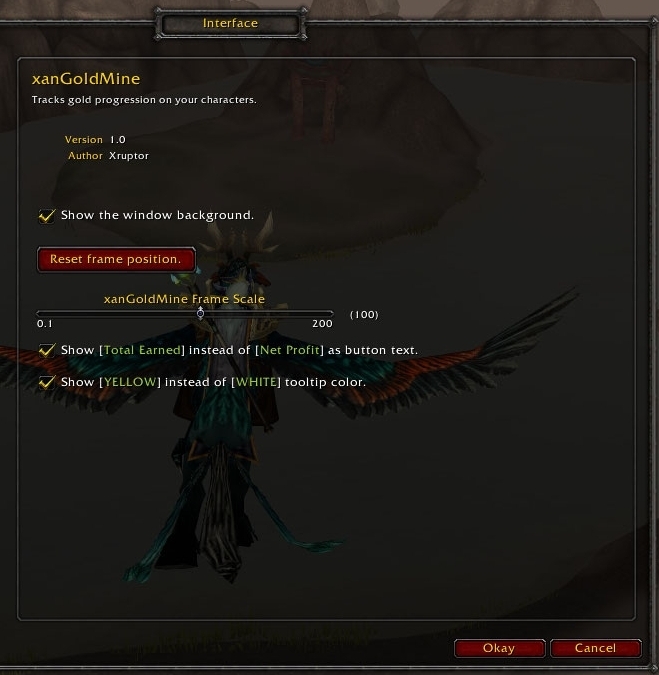 Taxi Fares = Gold spent on in game taxi's such as flight paths. Looted = Gold earned by looting monsters. Merchant = Gold +/- at merchant/vendors. Gold/Sec = Estimated gold earned by the Second. 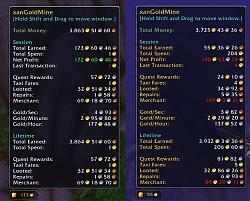 Gold/Minute = Estimated gold earned by the Minute. Gold/Hour = Estimated gold earned by the Hour. /xgm scale # -- changes the scale of the xanGoldMine frame. /xgm total -- Toggle between [Total Earned] instead of [Net Profit] as button text. /xgm color -- Toggle between [WHITE] instead of [YELLOW] tooltip color. This mod is extremely lightweight and small. The window can be dragged around and it will remember the position. -Added support for the wowinterface and curse autopackager.